Succeeding his brother, the Prince Regent, as Grand Master of the Premier Grand Lodge of England, the Duke of Sussex later became the first Grand Master of the United Grand Lodge of England in 1813. He held this position until his death in 1843. The Duke of Sussex established the Lodge of Reconciliation that produced the Emulation working creating a more inclusive, less obviously Christian freemasonry. His strongly advocated the more extensive use in freemasonry of G.A.O.T.U., meaning the Great Architect of the Universe, which had appeared in the Constitutons of 1723. Two hundred years later the use of G.A.O.T.U. in freemasonry remains controversial, although Christian theologians such as Thomas Aquinas hold that there is a Grand Architect of the Universe, and John Calvin, in his Institutes of the Christian Religion (published in 1536) often uses "the Architect of the Universe" and in his commentary on Psalm 19 refers to the "Great Architect" or "Architect of the Universe". The Duke of Sussex supported Catholic Emancipation, the Reform Bill and had many Jewish friends. His Spanish Hebrew Bible and German Pentateuch are among the treasures of the British Library. 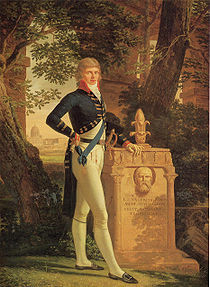 The only son of George III not to have a naval or military career, he attended the University of Göttingen in Germany in 1786 with his brothers Prince Ernest and Prince Adolphus. His interests included languages, art and science. He became a Freemason joining the Lodge Victorious Truth in 1798 in Berlin. The conclusion of the Napoleonic Wars in 1815 brought an end to twenty five years of nearly continuous war. At the Congress of Vienna, there was a desire "to bring the world to peaceful habits". Freemasonry stood at the dawn of a new age with great opportunities. Although conceived in a fraternity of Christian architects and scholars, freemasonry evolved into a universal Brotherhood of Man under the Fatherhood of God. The Duke of Sussex established freemasonry as a place where men of different faiths could meet in a bond of brotherhood, friendship and cameradie.